I'm excited to be able to hold a very special before Christmas giveaway! Husky Tools has given me a screwdriver set to give away! My first thought when the screwdriver arrived was that it looked like it would be perfect to use with all of the toys that we have that require a screw driver to replace the batteries. Sadie has one particular toy, a little MP3 player that is loaded with fun kid music that she got for her first birthday, that needs new batteries pretty much every day that she uses. This is one of the reasons it doesn't get used very often, because even with rechargeable batteries it was still a pain to find a screw driver and unscrew two little screws, replace the batteries and put the whole thing back together. 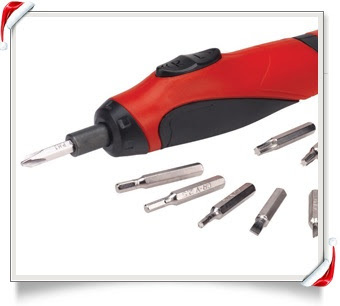 But this handy little power cordless screwdriver would make that kind of job much easier! After I was told that I could host this giveaway I went over and looked at the Husky site and I was surprised how many affordable tools they sell. This particular tool could be a present on its own or a really great stocking stuffer! Now for the giveaway rules (these are a little different this time). You can get one entry by doing one of two things: either tell me who you would give this tool to as a present (or if you'd keep it!) or tell me which of the other tools on the site is your favorite. For another entry you can mention it on facebook or twitter (1 entry each mention). And for one extra entry you can blog about it. This is a shorter contest because I want to get it in the mail early next week, although I'm not sure if it will make it by Christmas (a New Year's gift! Encouragement for fix-it projects around the house! ), so the contest will run until Monday at 7am Pacific time. I was provided with this tool, by Husky Tools, to give away to a lucky winner! There are 12 days of Christmas right? SO they just don't get it on the first day of Christmas. We have till epiphany to make it a Christmas gift. I would probably give it to my father, but my husband might use it. Both of them seem to collect tools. I'm totally going to blog about this and facebook it because it seems like such a great tool. I'm go to go check out the other tools on the site because this seems to useful even for me who never tends to do manual labor. What a wonderful gift this would make for my husband! My husband is wanting to do more woodwork, building outdoor chairs, a toy box, a bench for the entryway etc... etc... Mostly because he loves the challenge that this particular hobby offers him; it's very different from most other things he does. I'd definitely give this to my husband for encouragement. I'll post this to my facebook page too. I would love to have this! (for myself!) This looks like a great set that I could put to good use. We have the same problem with batteries and toys. I'd give it to my husband who handles changing and recharging the batteries. Right now we only have one Philips head screwdriver and it is always upstairs if we need it downstairs and vice versa. This tool would be really useful!